Gujarat High Court is looking to fill up the vacant positions of Peon. 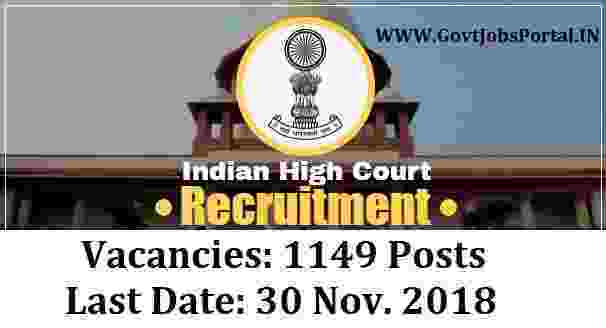 There are total 1149 vacancies which are going to be filled up through this High court recruitment process. This is a great opportunity for 10th pass candidates to grab a Government job in India. Online application are accepted for these 10th pass Government jobs for Peon posts. More information related to this High Court recruitment process is given below in this article. Read out the complete article carefully before applying online for this High Court Recruitment process 2018. In the table below we share the essential eligibility criteria such as the Education as well as the Age criteria. So those who satisfied both these criteria can apply for this High Court recruitment for Peon posts 2018. 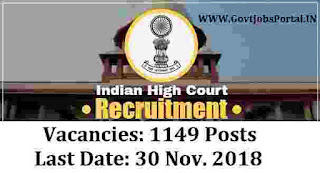 Those who have passed in the 10th class examination in any stream can apply for these Government jobs in the High court. Should have the age limit in between18 years to 33 years. The procedure for applying these 10th pass Government jobs is online. The link for applying online is available on the official website of the High court which will be activated on 1st Nov. 2018. Candidates can apply online up to 30th Nov. 2018. All eligible applicants for these High court jobs have to apply online between these dates. Check IMPORTANT LINK section for more information. 1ST Nov. 2018 is the Opening Date to apply.